Additional Wine Club Memberships Are Now Available! If you missed out on the first round of wine club subscriptions, we have decided to release another batch due to popular demand. We have a very limited number of spaces available, so if you want to secure your spot, be sure to sign up at http://club.winelandia.com ASAP! 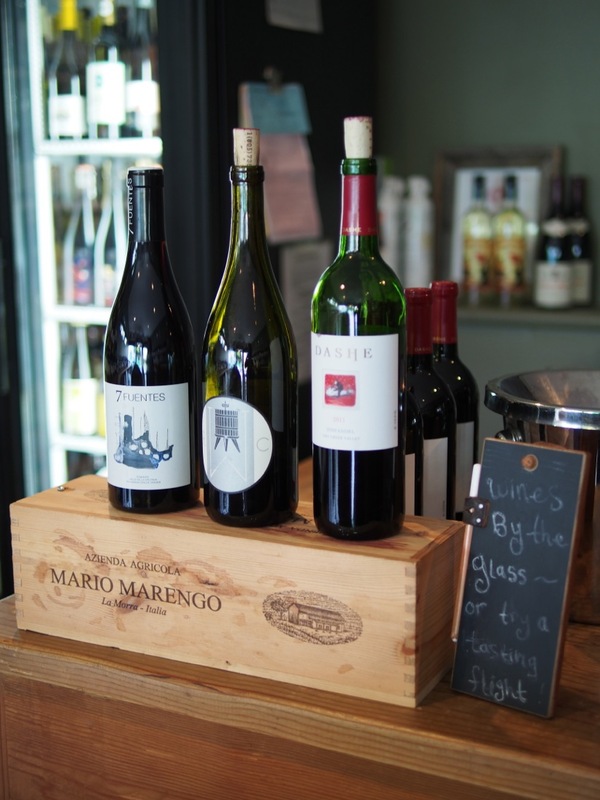 Join our boutique wine club to receive four annual 6 bottle shipments of wine (2 cases total per year). We are offering small-production, hand-crafted, terroir-driven wines that will never exceed a $25 bottle average price (no more than $150 per shipment, excluding tax & shipping). Our focus is on wines that are made with minimal intervention, farmed as sustainably as possible, and fermented with native yeasts. These are the types of wine that we like to drink, and more importantly, the types of wines we wish to share with you. We will have our first offer ready to ship in early November, just in time for the holidays. 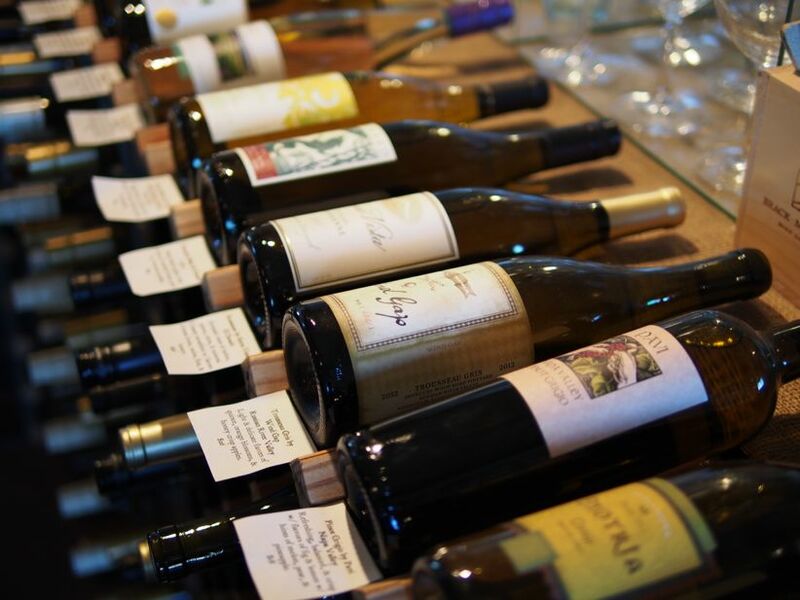 The wines that we have selected will all pair beautifully with your holiday meals. With this shipment we will include recipes, food pairing suggestions, and information about the winemakers & production. Join today to secure an allocation of these six fabulous wines! We won’t be releasing another batch of memberships until the next shipment, so get on it! Coming Soon: Purchasing Wine from Winelandia.com! It’s been about 7 months since we launched our blog with the intent of bringing you closer to the wines you consume as well as helping you discover the joy of food & wine pairing, mixology, cookery, and baking. It’s been a great experience for us since the beginning, considering we have to learn everything we write about. It’s been a joy to watch our reader base grow, and it’s been our honor to have your attention every Tuesday and Thursday morning. 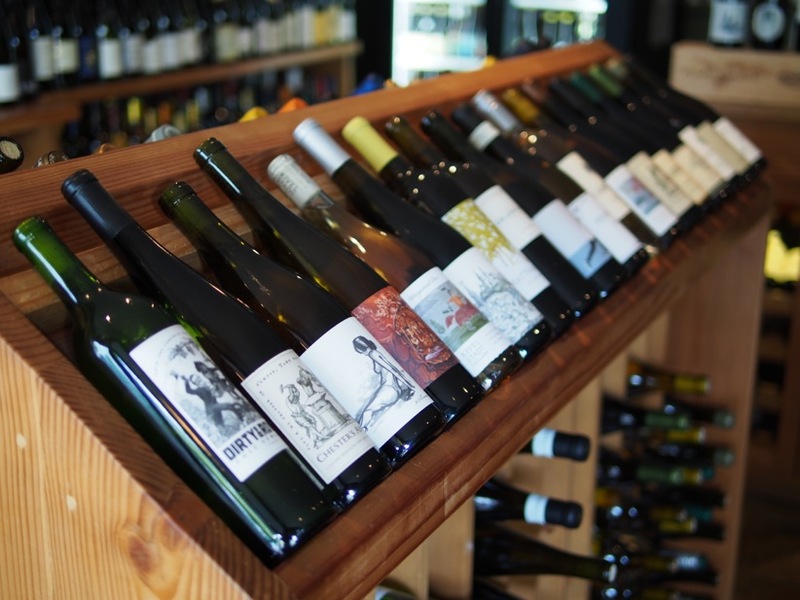 One of the longer-term goals of this project was the intent of launching a retail feature on the website, so you can buy wines curated by us and have them delivered to the doorstep of your home or office. 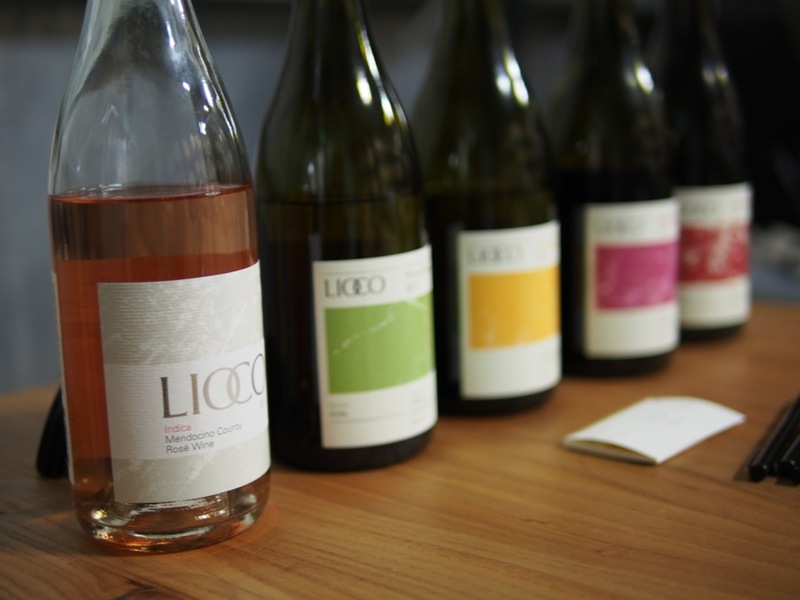 We love natural wines, made in small batches, hand-crafted by real people. Moreover, we love to share these wines with others, exposing great producers to people who might not be able to find them otherwise. The whole idea of Winelandia was born after several friends who came to our educational tasting parties began asking us how they could buy these wines from us. All we could do was point them in the direction of the shop we bought them at, or tell them “Sorry, this one is from my cellar”. The process involved in obtaining the appropriate licenses to buy and sell alcohol in the state of California is long, complicated, confusing, and at times, very frustrating. I am pretty sure the process is designed to be this way to weed out the riff-raff. Thankfully, we are not Riff-Raff, and the great state of California has approved and issued our license which allows us to buy and sell wine. 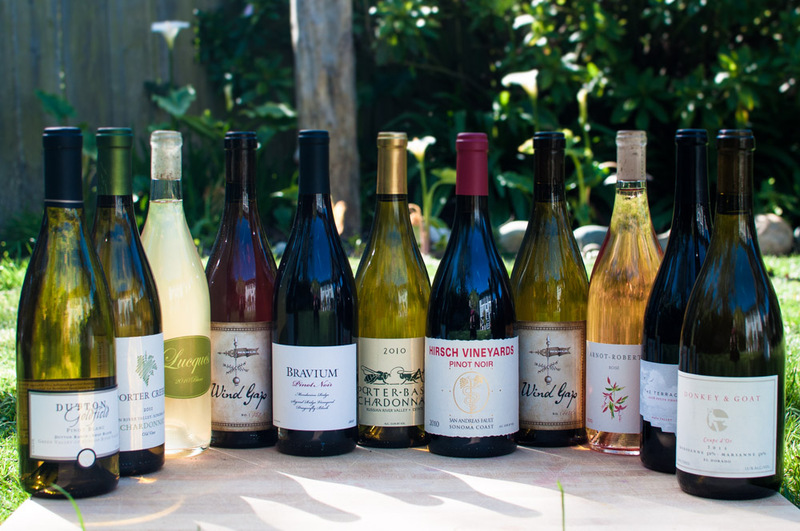 We are excited to announce that we are launching a wine subscription service to a very small pilot group of users in the state of California. The initial subscription is quarterly shipments of half-cases of wine. That’s 2 bottles a month, or 2 cases a year. The goal is to keep the price reasonable, around $25 per bottle on average. All of the featured wines will come with tasting notes, food pairing suggestions, and a recipe or two. We have some kinks to work out and need to test out some ideas on you guys, so if you are interested in joining the pilot program, please let me know by emailing me at tala@winelandia.com. We can only accommodate a small number of people, so be sure to let me know ASAP. Our goal is to have the first shipment out in time for Thanksgiving. If you are unable to get into the pilot group, we will have a wait-list up so you can be notified when we have room for more members. The incentive for you to join our pilot program is not only the honor of being able to tell your friends you were one of the first people to use Winelandia, but you will also receive first dibs on any extremely small-production or cult wines that we may not be able to secure enough of to offer as part of the subscription, before we offer them for sale on the website. I am a collector at heart and will take every opportunity to secure a case or two of really special wines for you guys. These are very exciting times for us, considering I have dreamed of owning a business since I was a little kid. Life is short; pursue your dreams, do things that are hard, and amaze yourself every time you accomplish something new. 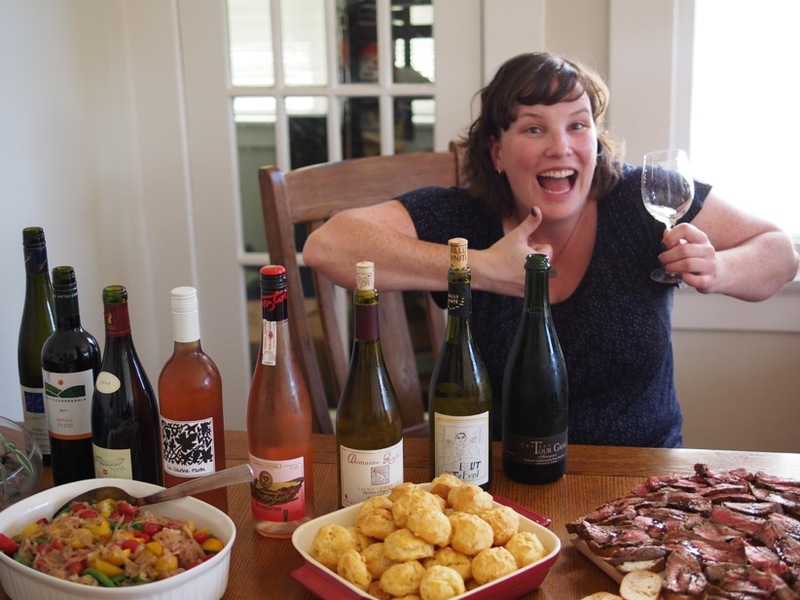 I’ll leave you with this photo of Colleen, being very excited, surrounded by food and wine. Basically, this is what we look like any time we are together. We hope that you will join us in this new chapter! Every year around the beginning of September, it gets really warm here in the Bay Area and in some of the foggy, freezing, coastal towns nearby. Some call it the Indian Summer. I just call it Summer, as it’s all I’ve ever known. What we experience from June through the end of August is NOT summer, just ask any local. Anyhow, our summer finally came around, luring the fog back over the ocean, finally exposing our coastline to the late summer sun. Colleen and I took the opportunity to drive north and visit the extreme Sonoma Coast. The California coast in the summer is a sight to behold. Highway 1 runs from North to South, offering expansive views of oceanside cliffs, sandy beaches, waterfalls, sycamore trees, pastures, azure waters, and blue skies for miles and miles. When I see the coast, it warms my heart and reminds me of why I pay a zillion dollars a month for rent to live in the Bay Area. I can drive an hour north or south and visit it anytime I want. I was practically raised on the beaches of Bodega Bay, my mom hauling us kids around with her as she explored the places that I still find myself drawn to today. These memories were the preface to our adventure. The first stop on our route was Bodega Bay, a small coastal town that sits right on top of the San Andreas fault. 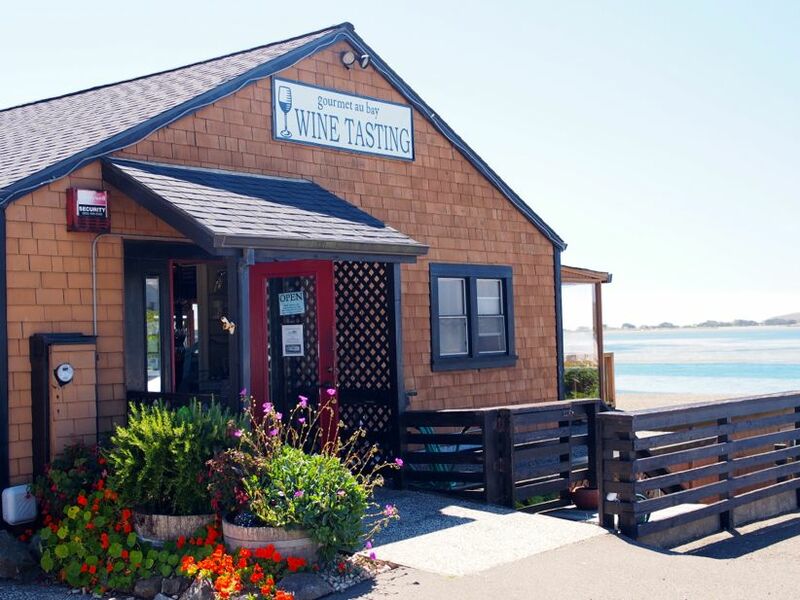 This adorable little village offers many amenities to people passing through, including a market, taffy shop, several restaurants, an ice cream parlor and an adorable little wine shop called Gourmet au Bay. All we had to see was the Wine Tasting sign and we pulled right into their parking lot. Colleen and I weren’t sure what to expect, but we were gleefully optimistic about the prospect of wine tasting on this beautiful, sunny day. 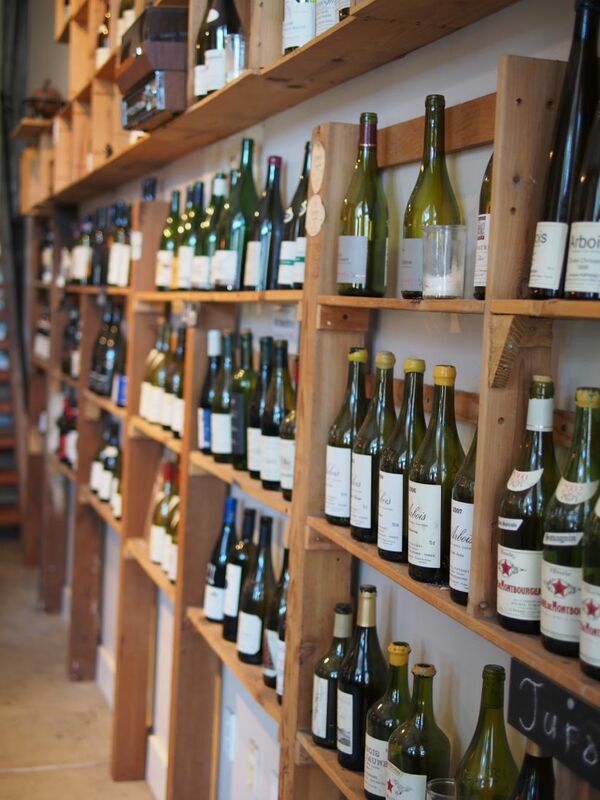 Upon entering, we noticed rows of wines for sale, with a wine bar selling wines by the glass in the back. 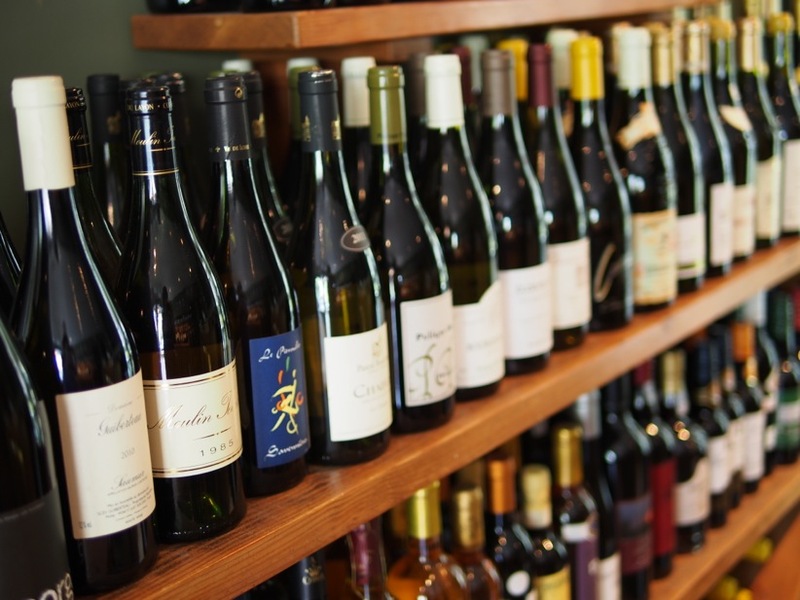 We took a closer look at the wines offered for retail sale and noticed some of our favorites. 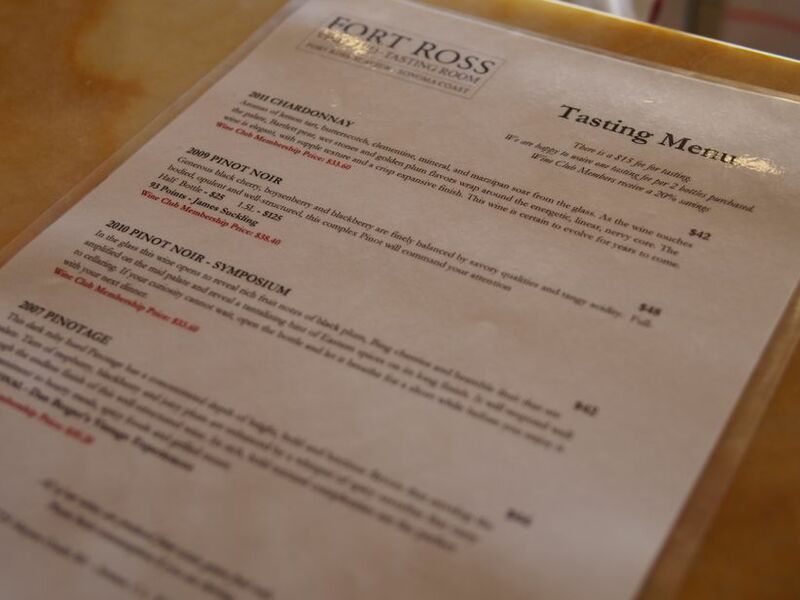 The selection here is mostly local wines, or at least wines from vineyards that are on the Sonoma Coast. The prices were reasonable, and if we were from out of town and looking for a special bottle to take home, this would be a good place to buy one. After inspecting the retail offerings, we made our way to the back and spied the wines by the glass. 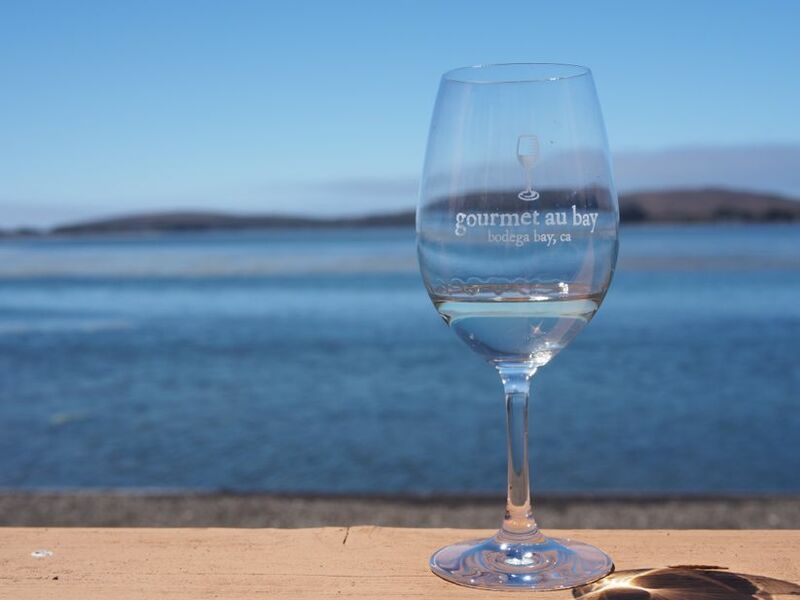 We settled on splitting a glass of Vermentino, and it wasn’t until then that we realized Gourmet Au Bay had a patio on the water. We deployed our huge sunglasses and took our tasty wine outside to enjoy with a spectacular view of the namesake Bodega Bay. 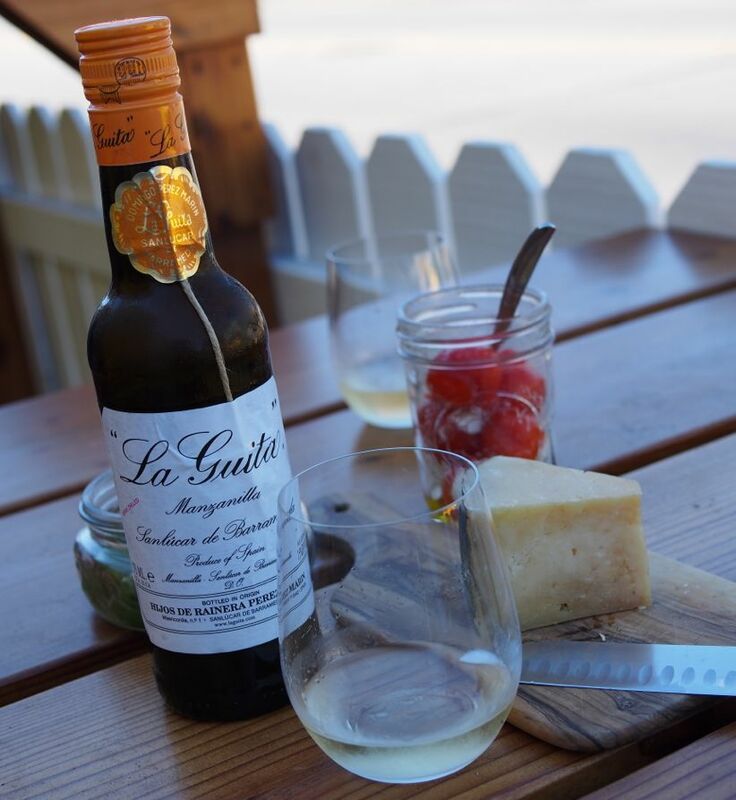 Gourmet au Bay is located at 913 Hwy 1 in Bodega Bay, CA 94923. 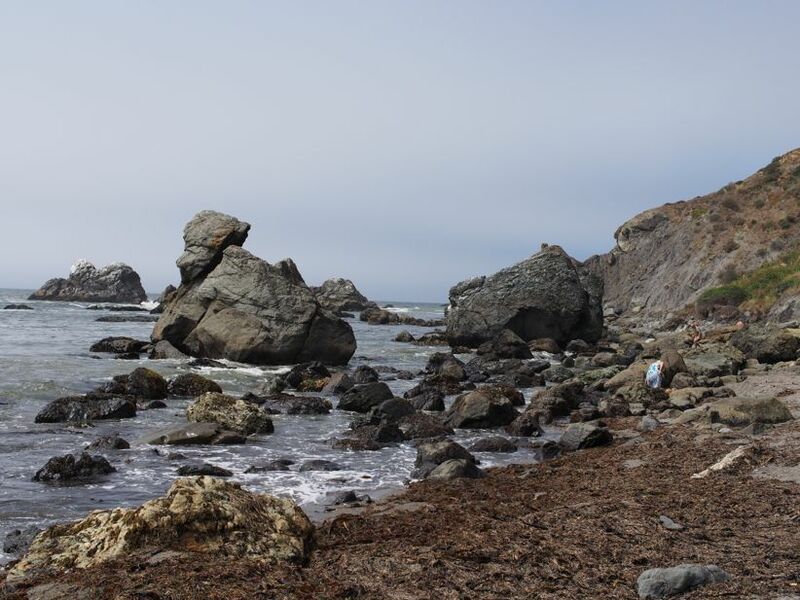 After taking in the view and slowly sipping on our glass of Vermentino, we packed up and journeyed north to check out some of the beautiful beaches Bodega Bay has to offer. When I was little, my mom took us to a tiny beach called Shell Beach for family adventures. I remember scrambling over the huge rocks, poking sea creatures in tidal pools with my finger (don’t try this at home), making sand-angels, and eating peanut butter sandwiches while watching the waves crash on the inhospitable shore (this is not a place you go swimming!). I thought it would be neat to show Colleen this beach and tell her stories about my family’s visits. 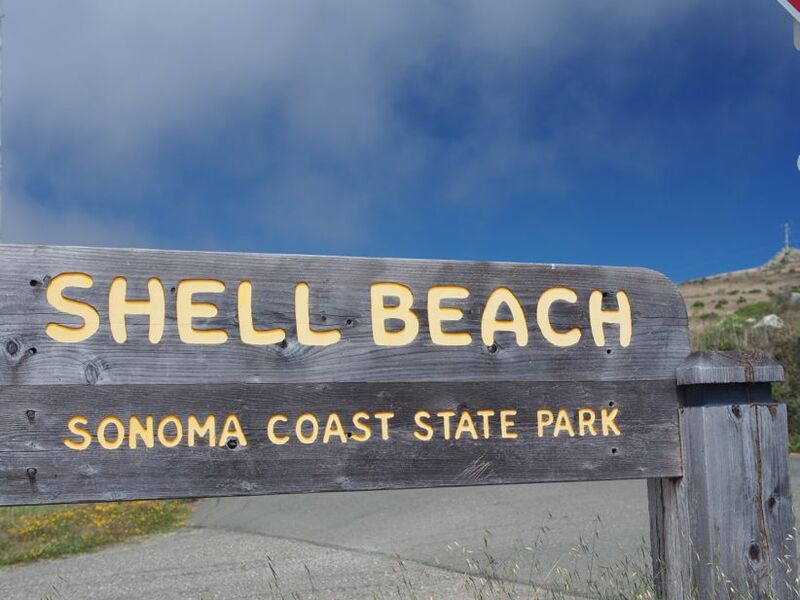 You can find Shell Beach by driving north of Bodega Bay for several miles, until you see the sign for Shell Beach. It’s farther north than most of the other beaches in the area, so keep driving even if you think you’ve passed it. This is a wonderful spot to stop at and enjoy your peanut butter sandwich, or just to take in the views. If you are lucky enough to be there during low tide, you can walk pretty far down the beach and see some of the less-traveled areas. I recommend always bringing layers, as even on this hot day the fog line was just over the highway, and the beach was pretty foggy and cold. After spending a few minutes torturing Colleen with boring family stories about the beach, we got back into the car and continued north. Our mission was to find a cow suitable for photography for the blog, from here on out known as the Picture Cow (not to be confused with a Gift Horse). If you’ve ever driven around here, then you are familiar with the miles and miles of green pastures inhabited by happy California dairy cows. If there’s any one scene that embodies the Sonoma Coast perfectly, it’s a serene cow munching on grass, mooing gently into the breeze. 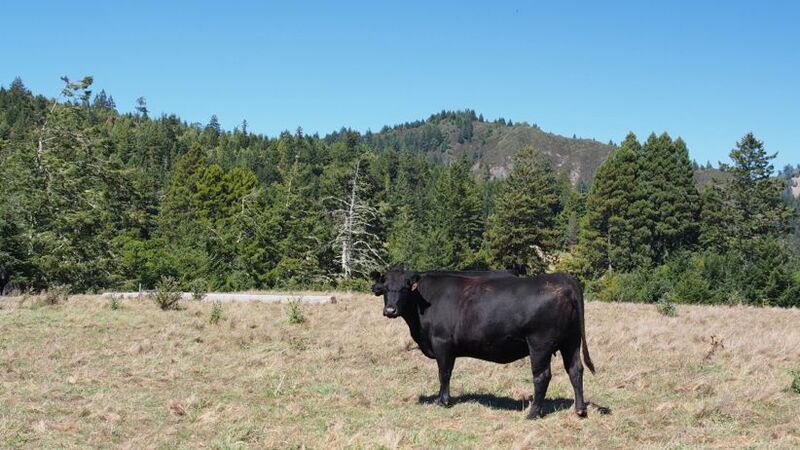 Eventually, we found the Picture Cow near Fort Ross. Pleased with our Picture Cow findings, we continued north until we reached our only planned destination, the Fort Ross Vineyard. Having been pleased with their wines at the Family Winemakers tasting a few weeks ago, we thought we would visit their winery and taste through their offerings without the madness of the event. 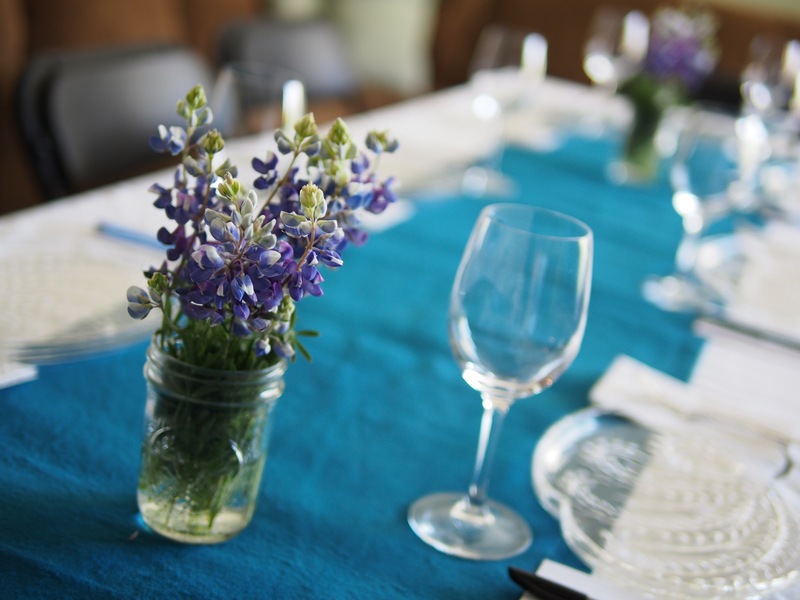 It’s one of the only winery tasting rooms open to the public on the Sonoma Coast, and they don’t require an appointment to enjoy a tasting. To find it, continue north past the town of Jenner (right past the mouth of the Russian River) and hang a right on Meyers Grade Road. Go up the hill, following the Winery signs, and you will see it on your right. Be sure to take in the views as you drive, as the highlight of this trip is not the destination, but the sights along the way. We enjoyed our flights of wine on the lovely patio of the tasting room. This place is very fancy, not your typical rustic Sonoma tasting room. The wines are remarkably California in style, with their Chardonnay being rich, bold and buttery. We quite enjoyed all of the wines, but the 2010 Symposium Pinot Noir was our favorite. We picked up a bottle and will be posting a review here soon, so stay tuned for that. After saying our goodbyes to the friendly folks at Fort Ross Vineyards, we turned south to meander back home, with at least one more destination in mind. If Colleen and I have any one thing in common, it’s our lust for oysters. 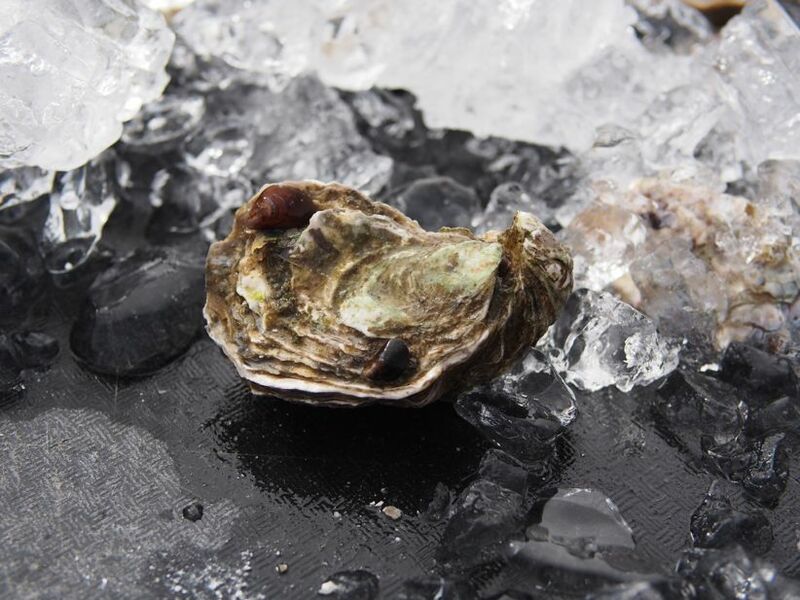 Delicious, briny, fresh, succulent oysters, gently plucked from the beautiful Tomales bay. Little did Colleen know, I had a special bottle of wine in the cooler, waiting for this occasion. 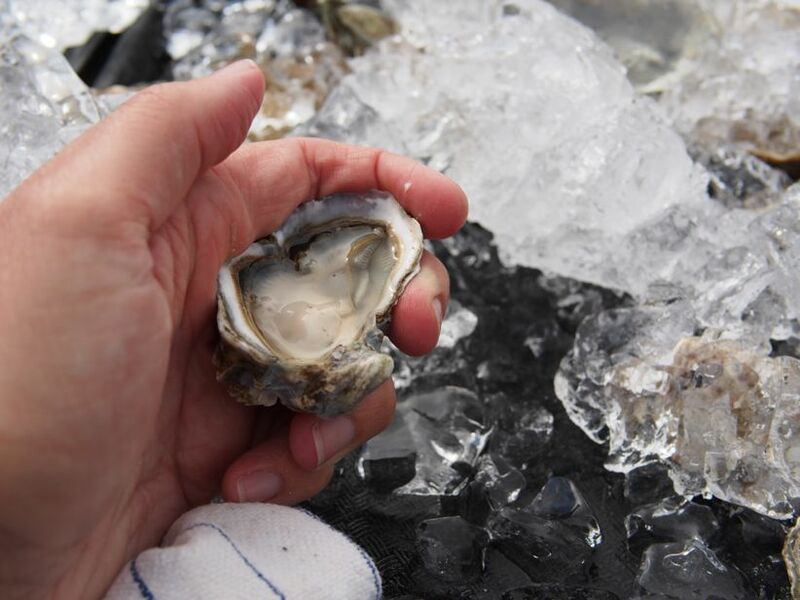 We made a bee-line back down to Hog Island Oyster Co. in Marshall, CA. 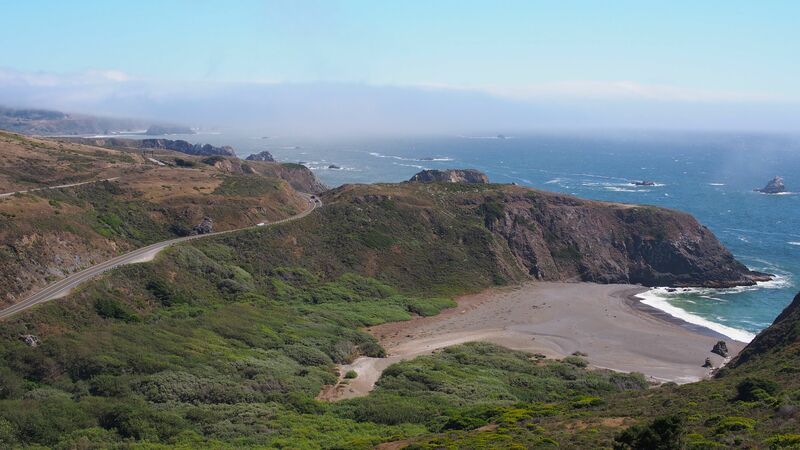 To get there from Fort Ross, just drive south on Highway 1 until you reach it. You have to do a little jig to stay on the highway once you pass Bodega Bay and it makes a left turn for Petaluma, just keep an eye out for the signs to stay on Highway 1. Once you turn right to stay on the Highway and head towards Marshall, just continue south until you see the farm on the right. On a normal day, you might not get as lucky as we did at the farm. The most cost-effective way to enjoy oysters here is at the Shuck-yer-Own picnic tables, which generally require a reservation made months in advance. Lucky for us, it was late in the day, and there was a vacant picnic table for us to shuck our own oysters at. You can also buy pre-shucked or BBQ oysters from the stand in the back, but you will pay a lot more that way. We decided on 3 dozen oysters total; 1 dozen Kumamoto (our fave), 1 dozen X-Small Sweetwaters, and 1 dozen Atlantic. If there is any duo on earth that can put away 3 dozen oysters, it’s the Ladies of Winelandia. We grabbed our oyster knives and got right to business. Shucking an oyster is a learned skill. It’s not as easy as those guys at the oyster bar make it look. I’ve shucked hundreds (if not thousands) of oysters, and I still struggle with it. My only advice is to never give up, and keep on shuckin’ until you become a master. I haven’t gotten there yet, but I will die trying. I love oysters so much, it won’t be a problem. 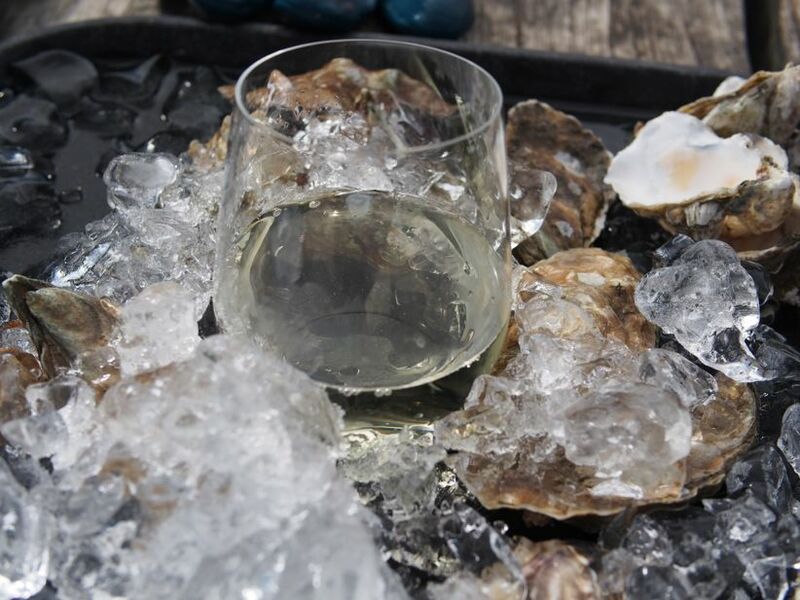 Wine and oysters are a match made in heaven, and there aren’t many white wines I wouldn’t pair with them. 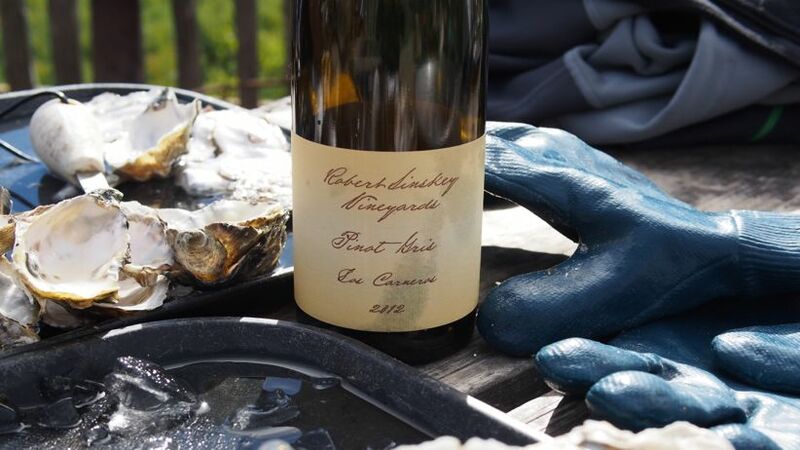 The only white wine I would avoid is anything with oak, as the woody or buttery flavor can clash with the fresh, briny oysters. I stashed a bottle of Robert Sinskey’s 2012 Pinot Gris in the cooler before we left, which on this hot day was closer to cellar temperature when we opened it. I wanted it to be ice cold, desperately, so we devised a technique we dubbed Ice Mountain to keep our wine cold. Worked like a charm. I encourage you to use our patented technology should you find yourself in a similar predicament. The Robert Sinskey 2012 Pinot Gris was perfect with these oysters. It’s rich, full-bodied, bright, pure, fruity, and refreshing. If Robert Sinskey does anything right, it’s white wine. They are some of my favorite from California, and they are one of the few producers to make a 100% dry Muscat, which is absolutely insane. If we are lucky, we might offer some Sinskey white wines on Winelandia.com once we start our retail operation. It was getting late in the day, and we needed to start heading back home. We decided to take the scenic route, meandering through Nicasio Valley and stopping at the reservoir to enjoy the last bit of sunshine before landing back in reality. The sun was getting low and casting a lovely golden hue on everything surrounding us. It’s days like this that remind me of why I started Winelandia. I want to share these experiences with people who weren’t lucky enough to be immersed in it their whole life, showing them the hidden gems along the way, and how to find ways to make the experience even richer. The landscape of California and the fruits of the vineyards, farmland and pastures have inspired me for decades. I am grateful to share these experiences with our readers. If you want to replicate our adventure, feel free to reach out to me directly (tala@winelandia.com) and I will send you a map with all of the side-missions and destinations. I certainly hope you enjoy it as much as we did. Urban Parklet Picnic: Sherry on 11th St. Recently, it came to my attention that I might be a fan of sherry. After all, I love oxidative white wines from the Jura, and especially Champagne made in a slightly oxidative style. I was given a bottle of Manzanilla sherry, presumably because the giver thought I am an old lady. He was right. The first thing I did was call up my Old Lady Partner in Crime (OLPIC), Colleen. We decided that this bottle of sherry needed to be enjoyed at 3PM on a Thursday, at a parklet on a busy street because, why not? Sherry is an incredibly inexpensive Spanish wine made in a solera and under flor. Because of the process, sherry takes on a very distinctive, oxidized, nutty aroma, which can be an acquired taste. The type of sherry we had, Manzanilla, is typically a lighter, fresher style of Sherry than it’s cousins. The color was light straw, the aroma strong and enticing. The flavors were saline, nutty, and mouth-filling, with an incredibly long finish. The acidity was crisp and refreshing, a nice balance to the unique flavor. As this sherry opened up, it became even more delicious and complex, and Colleen and I were both big fans. We paired this wine with a hard Spanish cheese, peppadew peppers stuffed with chèvre, castelvetrano olives, and a few hunks of Tartine bread. Sherry is one of the few wines that pairs well with both very salty or pickled foods, and I was very pleased with the outcome of our pairing. We snarfed up that whole block of cheese lickety-split. 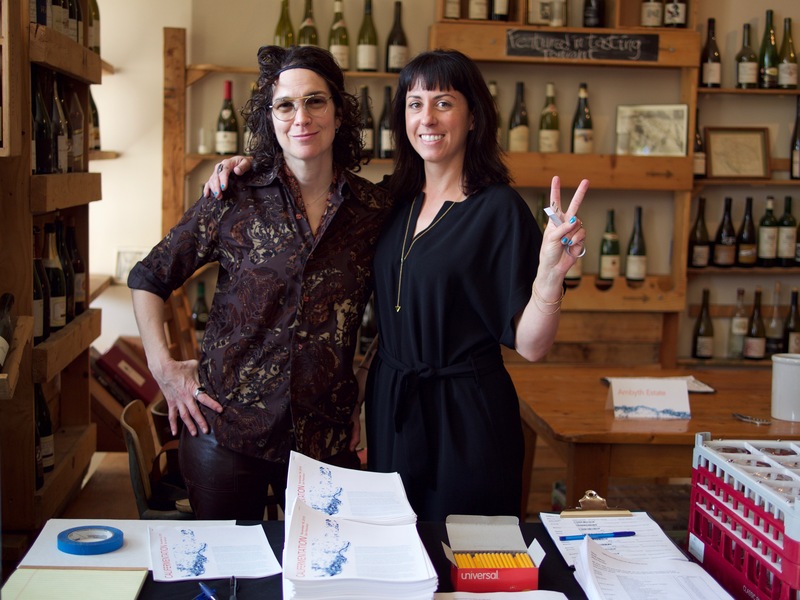 If you are a big fan of weird wine that doesn’t break the bank, go pick up a bottle of Sherry from Ruby Wine in Potrero Hill (which is where mine was from), or your friendly neighborhood wine shop. You will be very pleased with the price, and you can go then spend all the money you saved on some fancy hard Spanish cheese, and some Jamón Ibérico de bellota (pata negra only, please). Whatever you end up doing, be sure to enjoy it slowly, as the sherry we had really evolved with some air. 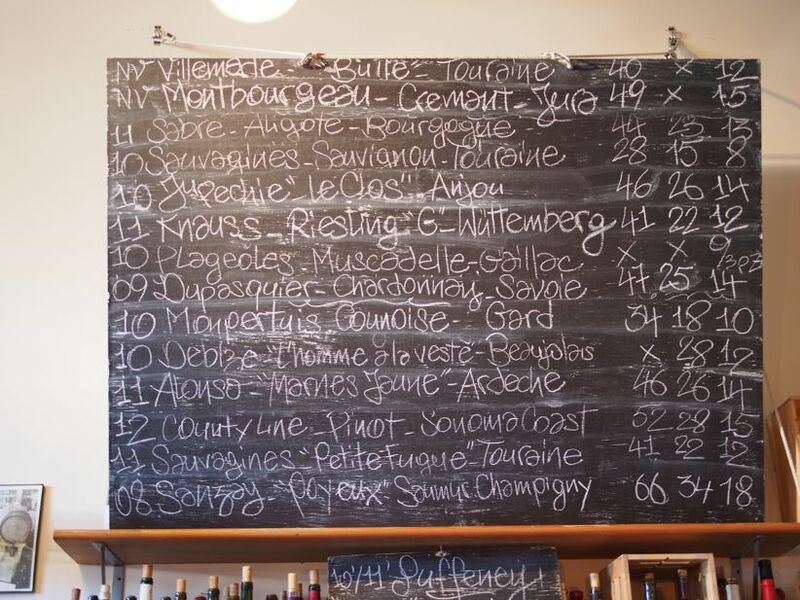 Tucked away in the hustle and bustle of Folsom street in SOMA lies Terroir, an unassuming wine bar with very little signage out front. You would probably walk right past it if you were looking for it specifically, and you might not know about it at all if you weren’t some sort of wine geek or fell upon it accidentally. Needless to say, it’s worth stepping into if you find yourself on the block with some time on your hands. The first thing you’ll notice walking into this place is the downright hip ambiance. Everything is so unintentionally stylish, with a distinct, playful Soma-in-Paris feel to it. It’s a mix of old-timey and modern with it’s steel stools, loft seating, dark grey bar, wooden accents and record player. I love to come here with a friend and chill out upstairs on a comfortable chair with a carafe of wine and a cheese plate. There’s something about the atmosphere here that begs you to slow down and stay a while. The wines served and sold here have a similar old-yet-new feel to them. One of the things I’ve heard repeated here time and time again is, “This is a real wine.” Terroir is very true to it’s name, serving only wines of terroir. Nothing added, nothing taken away. All of the wines here are either organic, biodynamic or just plain vin naturel. Chances are, you will not recognize a single wine on the menu. On a good day, I might be familiar with two. Don’t let the list intimidate you. Instead, tell the bartender what sort of wine you enjoy and they will help you find one to your liking. Terroir seems to specialize in white wines with acid, texture and mineral as well as red wines that are taught, lean, juicy and rustic. This is the sort of place you can find Jura by the glass or perhaps a Cheverney rouge. Not only do they have an impressive by-the-glass selection, but they also have tons of wines for retail sale by the bottle. 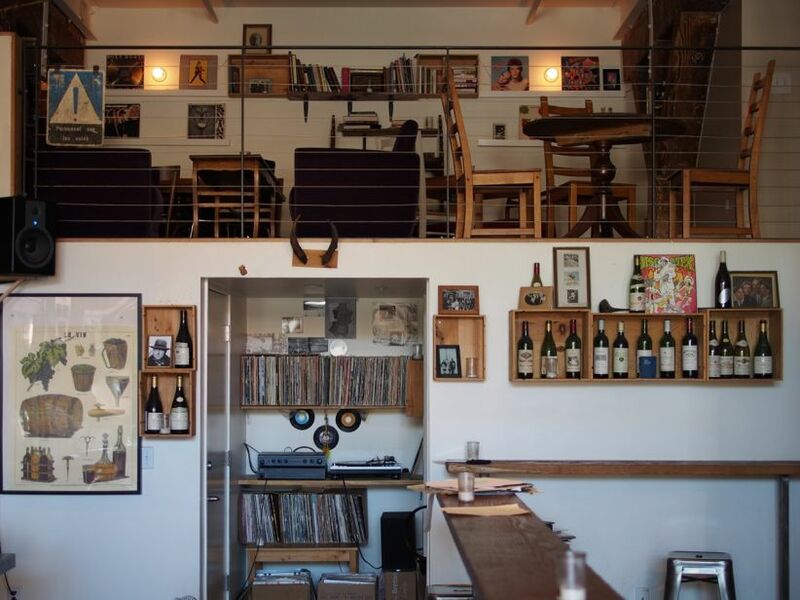 No, there isn’t a list, although if you see a wine out on the wall, they may have it for sale. Yes, they do sell high end Burgundies. Just tell the bartender what you are looking for. This is a great place for all sorts of people, from major wine geeks looking for the next mind-blowing $25 bottle to wine newbies looking for a romantic spot to go on a first, second, or third date. They open pretty early for a wine bar (2PM most days) which makes it a superb spot for people like myself with nowhere to be in the middle of the day. In the evening, it’s a very vibrant place with lots of locals of all ages stopping in for a glass or bottle. Whatever your persuasion may be, this is definitely a place to go out of your way to check out. You might even see me there, sitting at the bar, alone, enjoying a half-glass of Jura, and harassing the staff. Most new wine drinkers are completely overwhelmed by the numerous and mysterious options when they walk into a wine store. It’s completely justified – that feeling of being totally lost. It’s not your fault, either. While most domestic wines are labeled with the type of grape the wine is made from, many European wines are not. Instead they have the region, the country, the house that made the wine, or just a funky picture on the label. Moreover, the labels generally don’t say a word about what it tastes like, what food to pair with it, or any other indication of what’s in the bottle. How on earth will you know which wine to pick for dinner? 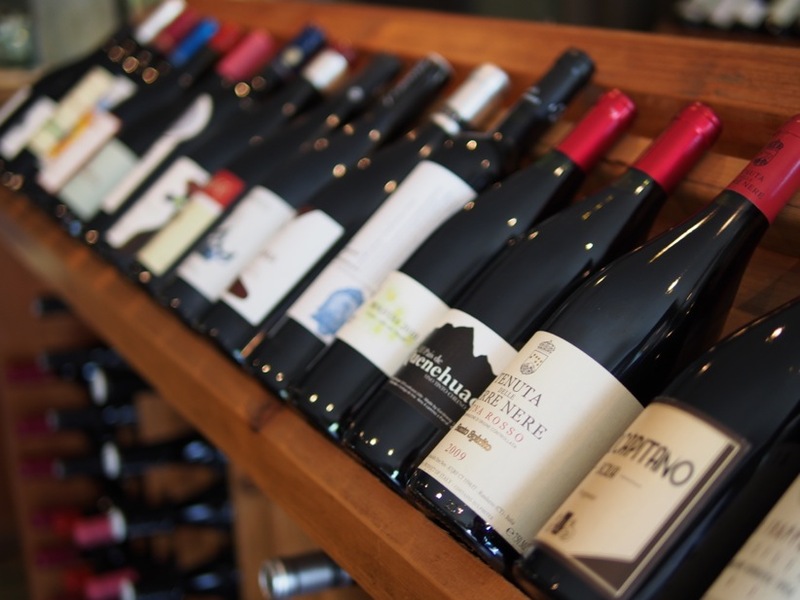 In this post we will go over some of the common types of wines you will see in a wine shop, what they are like, what foods they pair with, a general price range, what stemware to choose, and where they are grown. This grape is originally from Bordeaux but has gained a solid foothold virtually every wine market in the world. It’s one of the most widely-recognized varietals due to it’s widespread availability, ease of cultivation, and easy-to-pronounce name. It generally produces a very robust wine which can be appealing to a new wine-drinker’s palate due to it’s richness of flavor and enticing aromas. It can be very expensive, collectible and age-worthy. Still, if you know nothing about wine, chances are you’ve still had a glass of Cabernet Sauvignon. This fun, delicious, rustic wine is a staple in the New World, even though some believe it originated from Croatia. It counts for 10% of wine grapes planted in the US. While much of the Zinfandel vines grown are slated for “White Zinfandel” production, red Zinfandel is where it’s at. It can be made in many different styles and is a great wine to pair with food. It’s a wine that anybody can love, it was my gateway wine for sure. You can walk away with an exceptional bottle for around $25. Since the debut of the movie Sideways, Pinot Noir has experienced a renaissance in America. It’s seen greater plantings, higher prices, increased sales, and wider availability. Pinot Noir is notoriously difficult to grow and make good wine from. It prefers a cooler climate and longer growing season to warmer climates. Pinot Noir is famously grown in the Burgundy region of France (it’s one of three grapes legally allowed in Champagne), California, New Zealand, and is even gaining popularity in Oregon state. It can be difficult to warm up to, but it’s seductive textures and earthy aromas are bound to pull you in. This oft-maligned grape variety has been a staple in the New World while quietly making world-class, highly collectible wine in the Old World. Chardonnay is considered a ‘neutral’ grape, which means the flavor profile is easily manipulated through farming and winemaking practices. More importantly, it showcases the vine’s terroir very well when grown in mineral soils. The style of wine can vary wildly from stony, acidic and mineral to viscous, buttery and rich. I recommend finding examples from Chablis or the Russian River Valley with neutral oak treatments if you are just getting started. There isn’t a grape variety more polarizing than Sauvignon Blanc, yet it’s prolific on the shelves at your local grocery store and wine shop. It’s often grassy, pungent or tropical aromas can be off-putting to some, but delectable to others. It’s originally a wild grape from South West France, but has earned a reputation in Bordeaux & Sancerre while gaining widespread popularity throughout the New World. It’s usually very crisp and good with food or just by itself. It’s also one of the few wines that can pair with brussel sprouts, artichokes, broccoli and asparagus. Also known as Pinot Grigio, this grape is the mutant cousin of Pinot Noir. It has white juice and rose-colored skin, which means it can make crisp white wines or copper-hued skin-fermented wines. This is one of the best-selling wines in the world due to it’s approachability, food-friendliness and wide availability. It grows well in cooler climates and makes excellent wines in Northern Italy, Alsace, Oregon and Germany. It’s best to drink Pinot Gris while it’s young as only Alsatian examples age well. This sparkling wine is the hallmark of Catalonia, an independent nation in the North East corner of Spain. It’s all over the place in Barcelona as well as in the refrigerated section of your supermarket in the US. Don’t let the price fool you – Cava is one of the most delicious and inoffensive sparklers out there. It’s usually made from a blend of traditional Spanish grapes in the Methode Traditionelle (the same method used in Champagne). In Barcelona, it’s served by virtually every restaurant for 5-10 Euro per bottle and is the perfect accompaniment to tapas. If you are looking for an inexpensive, crowd friendly wine for a party or celebration, pick up some Cava. For about $15 you can get a pretty good one. Pink wine isn’t just for girls! Contrary to common belief, rosé isn’t usually sweet. Lots of it being made these days is mostly or completely dry, and sugar is only used to balance out the bracing acidity of some wines. By no means am I talking about White Zinfandel, Blush wine or anything made by Franzia or Carlo Rossi (avoid those like the plague). Some of the finest rosé wines come from the Provence region of France, but excellent variations can be found all of the world. Although rosé can be made from any red wine grape, they mostly taste very similar. It’s not meant to be thought-provoking, but it’s delicious and affordable. This summertime gulper is best enjoyed ice cold, on a warm night, with some light fare. Structure: Light to medium bodied, medium to high acidity, no tannin. Is there a type of wine that you’re curious about that you’d like us to cover? Let us know in the comments.